Crystal Dynamics studio boss Darrell Gallagher reveals the Tomb Raider reboot will hit six million units sold by the end of this month, and thanks fans for their support for making the game the fastest selling entry in the franchise's history. Just in case you didn't know, Lara Croft's latest adventure and reboot, simply titled Tomb Raider, has been quite the success for studio Crystal Dynamics and publisher Square Enix. While the publisher expressed disappointment at the title's early sales figures even though it turned a profit, that might change very, very soon. 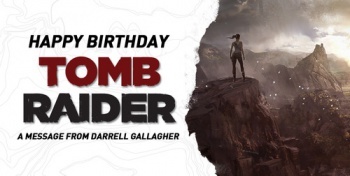 In a post on the official Tomb Raider Tumblr, Crystal Dynamics boss Darrell Gallagher posted a lengthy message announcing that its the game's "Birthday" this week, and congratulated fans for their support for the game's success. According to Gallagher, they will surpass six million units sold by the end of the month, and "having achieved profitability in 2013," Tomb Raider has "exceeded profit expectations and continues to make significant contributions to our overall financial performance." Gallagher adds that at launch, the reboot has set franchise records for the fastest selling day one and month one in Tomb Raider series history, and this, in turn, has made the Tomb Raider (2013) the best-selling game in the franchise's history. Not only did Gallagher thank fans, but he also used the message to state what's ahead for the series. "And like every great adventure, the story continues long after the initial launch. It's great to be able to look back at the last twelve months and share some of the achievements we are really proud of. We can't wait to continue our adventures with Lara in the sequel that is in development at Crystal Dynamics. We are also looking forward to building on the success and lessons learned from the reboot to continue redefining and setting new benchmarks for Tomb Raider in the years to come," Gallagher finishes. As someone who loved the reboot, I'm very happy that it's exceeding expectations. While six million units sold might be small compared to the Call of Dutys and Grand Theft Autos of the gaming world, it's still a very impressive achievement -- especially for a franchise deemed irrelevant by some. If you've yet to play the reboot, The Escapist's review gives it a full five-star mark, and states, "This is the Tomb Raider you've wanted for years."